The cover artwork may show a Lara Croft after a long and hard drinking night, but the five musicians from Stuttgart sound anything but hung over on Souldrinker. They move adroitly between thrash metal, death metal and metalcore, managing despite the well known ingredients to concoct an exciting album. The most astonishing element is the band’s background, with two members also playing with Mystic Prophecy and Symphorce, two classic power metal bands. At least the vocalist has a rawer past with his former band Inzest. Watch Me Bleed’s debut album starts quite muscular with the opener Rise, but also surprises with truly complex structures. The band sounds strongest whenever the thrash component prevails, as on the unpolished Bloodred Rain. Those more into modern sounds will prefer Sixsixseven that comes with upbeat mosh parts and an excellent rhythmic groove. Dead Sky Black Sun shows the band from an usual brutal, even hysterical side, but still has room for contrasting guitar harmonies. Watch Me Bleed walk an interesting and varied path through the harder regions of metal. No matter what direction they choose, the band always gets straight to the point. The songs are without an exception dynamic and compact, thus avoiding unnecessary lengths. The album ends with the fitting smasher The Bleeding Chalice, featuring Brainstorm’s Andy B. on guest vocals. 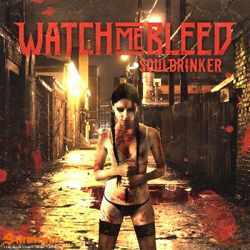 Souldrinker is an album that’s just great fun listening to. Without offering anything substantially new, Watch Me Bleed are still able to take you on a gripping journey through the heavier kinds of metal. It’s obvious that the musicians have garnered already a lot of experience in previous bands, otherwise such a mature performance would have been unlikely. Only the band name is somewhat unlikely, giving the impression that we have to deal with another young upstart metalcore band.